I am thrilled to share the work of Jenny Bova with you today. 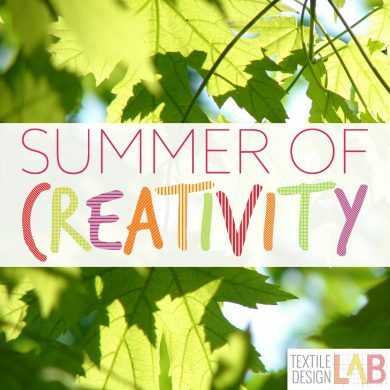 I have known Jenny for quite some time through the Textile Design Lab and I am so excited to share her story with the larger Pattern Observer community. 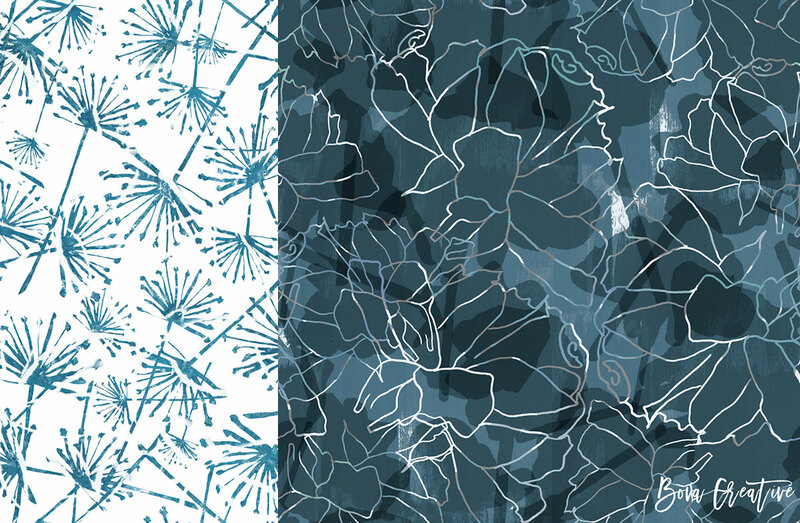 Jenny creates modern patterns with a dash of organic sophistication. She starts her work off the computer, which I believe allows her artistic style to shine. This is her story. “When I was a child my mom would sew my outfits and went to great lengths to make sure that the tops and the bottoms matched. To this day she will tell you I never once wore a matching set. The top to one and the bottom of another. I guess I started out seeing things my own way. My poor mom—I now know how much work it was and how frustrating that must have been! “My education is a BA from Bates College where I studied Art and English. My Master’s degree is in Industrial Design from Pratt Institute in Brooklyn. I decided that I wanted to be a designer on a family trip to England while I was in college. I distinctly remember standing in the Collier Campbell shop in London thinking, “THIS is what I want to do.” I returned to school in Maine and promptly switched my major from English to Art. “It has taken me a long time to get back to that initial inspiration. I’ve worked in retail design, advertising, and interior design. I even designed a line of handbags that were sold in boutiques throughout the country. My long experience in interior design finally led me back to surface pattern design. 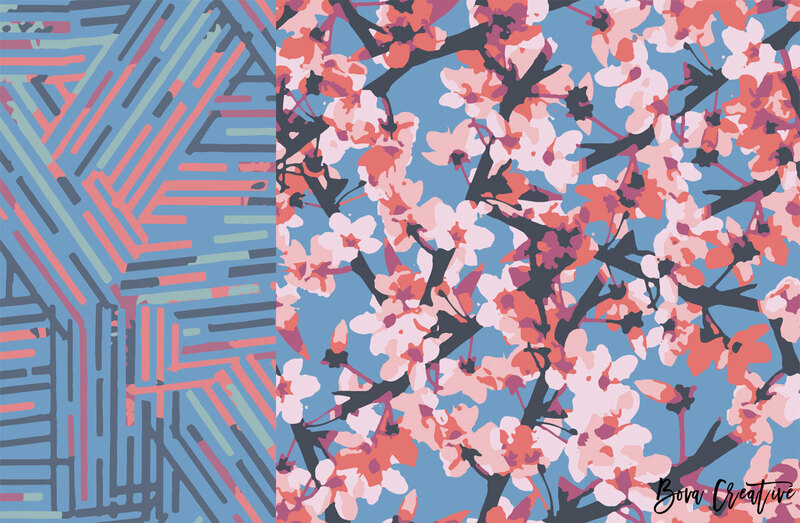 I constantly wanted to change colors and designs that I was specifying, which led me to start creating repeat designs. From there my product design background kicked-in and we’ve begun to develop our own product line featuring our surface pattern designs. “My husband, Clint, is my business partner in our company, Bova Creative. We are moving away from providing design services and are focused on art, surface pattern licensing, and developing our line of products. We both love to work with our hands so some of the pieces we sell are crafted in our studio, such as the glass trays that we sell on our site. “My inspiration for these designs came from nature and the fleeting, changing essence of our daily surroundings. I studied different buds, blooms, leaves, petals—some on a macro level. I love texture and color, and nature has an abundance of both. “In general, I follow fashion and the overall trends to influence my work. Even if the project isn’t fashion based, I believe that a lot of the design we live with originates in fashion. My process always begins with a tone of voice board or back beat so that I am clear on my vision. Then I start sketching and expand the motifs and ideas I’ve developed in watercolor, ink, and lino prints. By using multiple mediums I’m able to develop my designs in ways that I wouldn’t get with just a single exploration. Finally, I scan everything and develop my layout and colors in Photoshop. Depending upon the market and the style of the print, I will index the color. Sometimes that’s my favorite part. 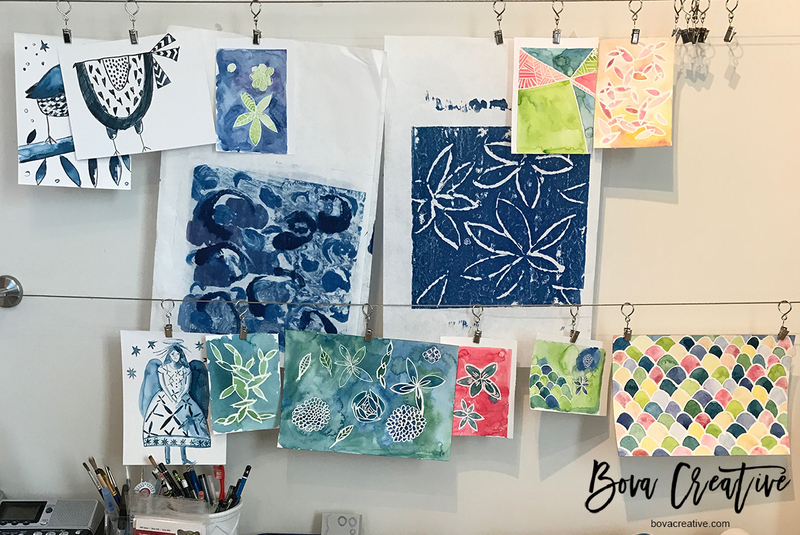 You can explore Jenny’s beautiful portfolio and product line on her website, Bovacreativeshop.com.